Southport - Premium Moving, Inc.Premium Moving, Inc. Premium Moving offers moving services to and from Southport, NC. Southport is a quaint historic town that offers numerous restaurants, shops of all types and historic sites. 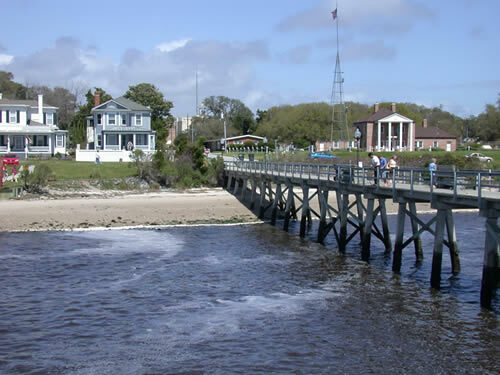 It is located where the Cape Fear River opens onto the Atlantic Ocean and it is also met there by the Intracoastal waterway. Southport has a long history as it was established in 1792 when the town of Smithville was created. Later, the town was renamed Southport. This community saw the establishment of North Carolina’s first fort, Fort Johnston in 1754. Today, Southport hosts the North Carolina’s official 4th of July Festival when over 60,000 people come to celebrate this great day on her streets. Citizens gather at Forth Johnston and observe a 13 gun military salute to the original 13 states. Southport is listed in the National Register of historic places. It is also ranked by Rand McNally and Kiplinger as one of the most desirable places in the united states to retire. For a glimpse of Southport, read local author Robert Ruark’s novel, The Old Man and the Boy.